The interactive animation depicts the rolling resistance acting on a circular object located on an incline. The animation shows a round object on a seesaw with an adjustable angel. At a specific angel, the object starts moving. The time this occurs depends on the rolling friction coefficient, which can be set in this animation. 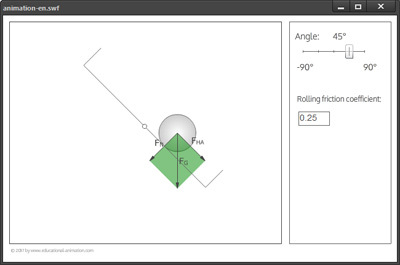 In the interactive animation, the weight force (FG) and the resulting downhill-slope force (FHA) and the normal force (FN) is shown. The angle of the slope can be freely adjusted. The force vectors are automatically updated and displayed in real time. The rolling friction coefficient can be entered in the field on the right. When the downhill-slope force FHA overcomes the rolling friction, the object rolls downward. In the animation this movement of an object is simulated.